Are you stuck with stubborn acne? Are you a teenager? An adult? Do not disparage. Do not despair. 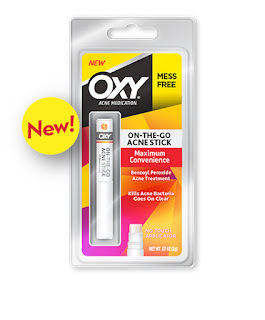 OXY On-The-Go Acne Stick is here! With a single bound it can destroy an acne blemish on the go, in a touch up situation or at home in a destroy mission. It contains 5% benzoyl peroxide. Benzoyl peroxide is perfect for fighting and treating acne blemishes, especially in a lowered percentage like this because: a) it kills bacteria that cause acne, which are present on acne blemishes like pustules and whiteheads. b) it actually exfoliates the skin, helping to get rid of the acne blemish altogether. It can help unclog a blackhead so that it can be removed from the skin; can rid the skin of a pustule, so it can heal; and get rid of whiteheads so they can heal too; and finally it is portable so it can be used at home or outside of the home, lightly on top of makeup so that it can be used whenever you want to, so that the blemish gets treated and the follicular blockage can be treated and removed so that the follicle is cleared of debris and can be free to just grow regular hair again. It does not require that you wash your hands to use this product. It has an on-the-go convenience, it goes in your bag or backpack. This product goes on clear with a no-touch, mess-free applicator. It can be worn over makeup, since it is dabbed on. To use: cleanse skin thoroughly before applying this product. Cover entire affected area with a thin coating 1-3 times daily. Because excessive drying of the skin may occur, start with 1 time per day then increase every next day by 1 time until you are up to 3 times a day. If excessive drying does occur, go down to 1 time per day or 1 time every other day if needed. Skin irritation may occur, characterized by redness, burning, itching, peeling, or swelling. Reduce irritation by decreasing use or discontinue use of this product. Make sure to use a sunscreen, this product can cause skin sensitivity. Also, this product may lighten hair and some towels and linens. Wash hands after using and use all white pillow cases. I had a blemish disappear in two days because of this stick. The On-The-Go Acne Stick cleared up a pimple in two days. I was pleasantly surprised, lower strength products take up 5 days and higher strength products cause my skin to peel. OXY On-The-Go Acne Stick can be purchased at any mass market retailer such as Walgreens, Rite-Aid, CVS, Target and WalMart. Like Oxy Skin Care on Facebook: https://www.facebook.com/oxyskincare; Follow Oxy Skin Care on Twitter:@OXYSkinCare and Subscribe to Oxy Skin Care on YouTube: https://www.youtube.com/user/oxyskincare.